Birth*: Arthusa Faulkner was born on 27 September 1865 at Keithsburg, IL. She was the daughter of Levi Tipton Faulkner and Mary Ann H. Coffey. Marriage*: Arthusa Faulkner married George H. Bartley circa 1883. Death*: Arthusa Faulkner died on 27 February 1954 at Carthage, MO, at age 88 . Birth*: Asa Faulkner was born before 1755. [S2325] Falkner, Asa Family Bible, Bible is owned by Mrs. J.T. Caudle of Peachland, N.C. 28133 as of 7 March 1981. [S2326] 1880 Anson Co., N.C. Census. [S1630] Unknown volume, Anson Co., N.C. Death Certificate, unknown repository. He was the son of Arthur Sylvester Faulkner and Hettie H. Faulkner. [S2404] Unknown volume, Hamblen Co., Tenn. Death Certificiate, www.Ancestry.com. Birth*: Aveyrilla Faulkner was born before 1770. She was the daughter of (?) Faulkner. Birth*: Bartholomew Faulkner was born circa 1826. Death*: Bartholomew Faulkner died circa 1846 at Andrew Co., MO. [S487] Shirley D. and Richard C. Harris, The Chenoweth Family in America, page 114. She was the daughter of Lorenzo Dowd Faulkner and Nannie Russell Falkner. She was the daughter of Henry Pierce Falkner and Maggie May Gupton. He was the son of John Henry Faulkner and Mary Gertrude Skittletharpe. Marriage*: Bellven Justice Faulkner married Elizabeth Anne Lowe circa 1950. Marriage*: Bellven Justice Faulkner married Alice Edith Barber, daughter of Lonnie Edward Barber, circa 1955. Marriage*: Bellven Justice Faulkner married Debra Gail Bailey circa 1962 at SC. 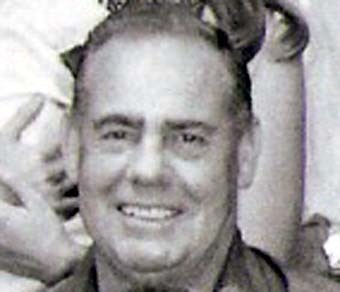 Marriage*: He married Elizabeth Anne Lowe circa 1950. Birth*: Benjamin Faulkner was born circa 1688 at MD. Marriage*: Benjamin Faulkner married Elenor (?) circa 1704 at Md. Death*: Benjamin Faulkner died circa 1728 at Queen Anne's Co., MD. He was the son of Jacob Faulkner and Sally Bailey. [S26] Wirt Johnson Carrington, History of Halifax Co., Virginia, pg 447. Marriage*: Benjamin Faulkner married an unknown person. Birth*: He was born before 1772. Birth*: Benjamin Faulkner was born circa 1705 at Md. [S393] Unknown author, Queen Anne's County, Maryland Land Records 1738-1747, page 81. Birth*: Benjamin Faulkner was born in 1776 at NC/SC. Death*: He died after 1850 at GA . Birth*: Benjamin Faulkner was born circa 1846 at GA. He was the son of Peter Franklin Faulkner and Caroline W. Warren. Birth*: Benjamin Faulkner was born circa 1754. [S49] Mary Wilson McBee, Anson County, N.C. Abstracts of Early Records, pg 122. [S49] Mary Wilson McBee, Anson County, N.C. Abstracts of Early Records. [S1280] 1850 Randolph Co., N.C. Census. Death*: Benjamin Franklin Faulkner died on 12 July 1918 at Petersburg, VA, at age 34 . [S1346] 1900 Dinwiddie Co., Va. Census. 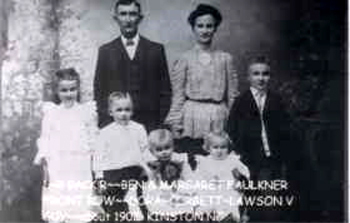 Birth*: Benjamin Hardy Faulkner was born circa 1804 at Warren Co., NC, It has not been proved that Benjamin Hardy Faulkner is a son of Bartholomew. However, he is the right age and appeared living next to Bartholowmew in the 1830 Franklin Co. Census. Another possible son also was listed in this census. He was the son of Bartholomew Falkner and Sarah "Sally" Clark. Death*: Benjamin Hardy Faulkner died after 10 June 1880 . Marriage Certificate of J.B. Faulkner states that both Benj. and Rebecca were both living at time of his marriage 13 Dec 1876. Also, they are both listed in the 1880 Franklin Co., N.C. Census. He was the son of Alexander "Sandy" Faulkner and Hicksey Roberson. Death*: He died circa 1784 at Halifax Co., VA.